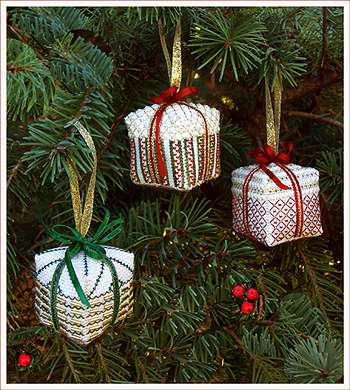 three elegant mini christmas ornaments! Stitch these adorable and simple to stitch tiny Christmas Gifts for your smaller tree this Christmas! Linda's created them to fit perfectly on a smaller tree, as well as any larger tree! This leaflet contains three of the cutest little Christmas ornaments you’ve ever seen! 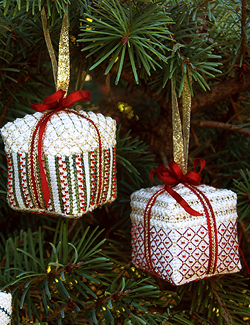 Wrap these little “Christmas Gifts” - in sparkling beads and threads and hang them on your tree to show some glitz! They will add dramatic sparkle and colour to any room and make Christmas decorations and presents look even more beautiful! 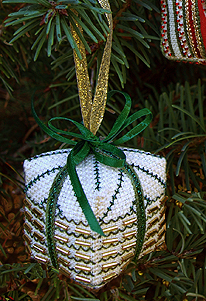 Each glittering ornament is lovingly created with red, green and cream silk threads, gold and green metallic braid, using fun and easy specialty stitches and bugle and seed beads galore! They are stitched together easily, hanger added, and tied with a bow. This is another fast stitch and finish for those of you who have little time during the holidays!